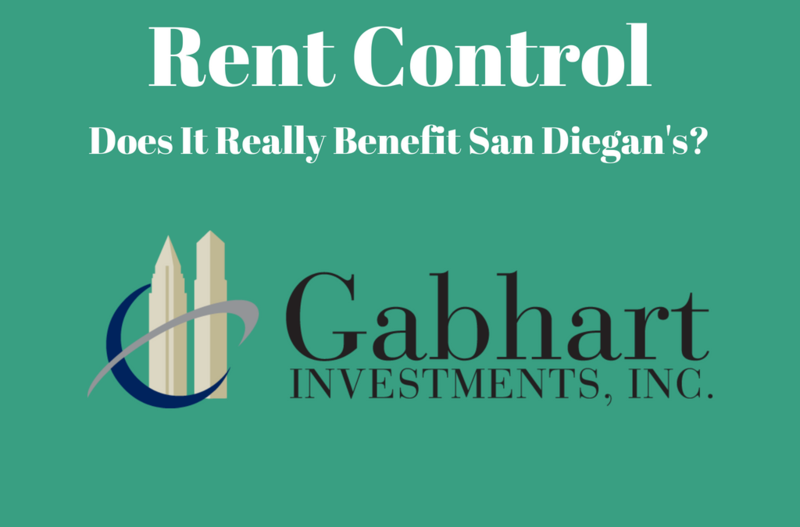 Real Estate Market Archives - Gabhart Investments, Inc.
San Diego Rent control and restrictions on short-term vacation rentals could have devastating impacts on the San Diego real estate market and economy. Are you an investor, real estate professional, landlord or even a resident that is interested in discovering how this could impact you? It’s time to educate yourself and let your voice be heard. 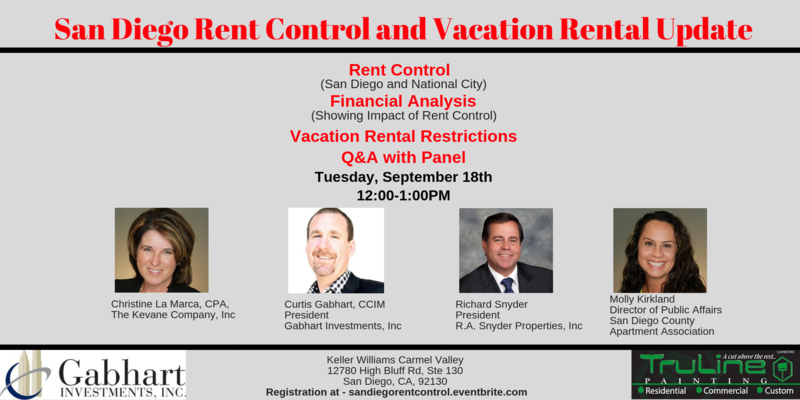 In this interactive and informative 60-minute class, Curtis Gabhart and an expert panel of speakers will present an in-depth overview of both San Diego rent control and restrictions on short-term vacation rentals. Molly Kirkland: Molly has been serving the San Diego region in the governmental affairs field for well over a decade. For nearly 7 years, she has served as the Director of Public Affairs for the San Diego County Apartment Association (SDCAA). Prior to working with SDCAA, Molly worked in Government Affairs and Communications for the San Diego Association of REALTORS. Richard A. Snyder, CPM: a Real Estate Professional for over 30 Years, is the President and Owner/Broker of R.A. Snyder Properties, Inc., located in San Diego California, where he is a recognized leader in the Real Estate Industry. Rick is a Past President of San Diego County Apartment Association and he continues to lead as Co-Chair of the local effort to defeat Rent Control in National City and the local No on 10 Statewide campaign to protect Costa-Hawkins. Christine La Marca: is a San Diego native with over 20 years of residential property management experience. She is responsible for the day-to-day management of her family’s real estate portfolio. She is the Immediate Past President of the San Diego County Apartment Association, and she is currently still actively serving the Association as Co-Chair of the local No on 10 Statewide campaign to protect Costa-Hawkins and the local efforts to defeat Rent Control in National City. 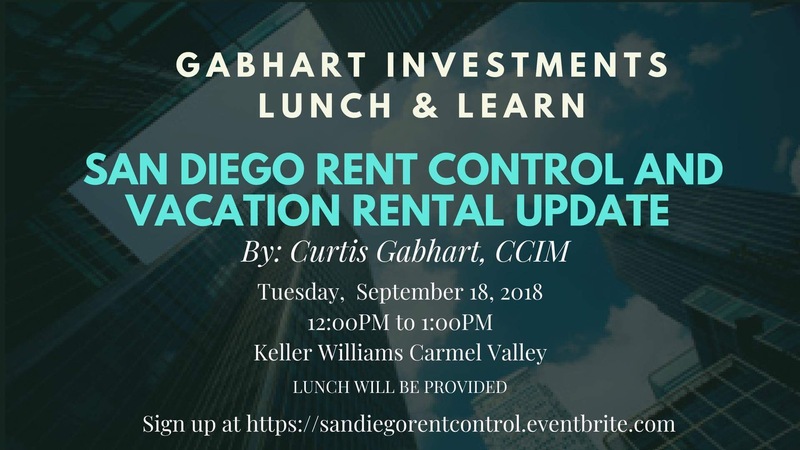 Check out Curtis’s San Diego rent control blog post to catch yourself up to speed before you attend. We would be thrilled if you could join us for this special event. Lunch will be provided to those who RSVP in advance. Space is limited so please register as early as possible. Additional details are listed below. To RSVP, follow the ticket prompt below confirming you will be in attendance or recommend someone else from your office if you are unable to attend. Thanks very much! We hope to see you there! Curtis Gabhart has been a successful Real Estate professional for more than a decade. He has a Certified Commercial Investment Member (CCIM) designation from the CCIM Institute. He is a Director at Keller Williams Commercial Brokerage and President of Gabhart Investments, Inc, a privately held real estate investment firm that manages a syndication of private investors, specializing in acquiring and renovating single and multi-family properties. He also serves on the Commercial Advisory Board at the University of San Diego Burnham-Moores Center for Real Estate and he teaches commercial real estate courses for the California Association of REALTORS® and San Diego Association of REALTORS®. He has been recognized by members of Congress, California State Senators, the City of San Diego, and had a day named after him in the County of San Diego for his community service and dedication to the community. He was awarded as the Dealmaker of the Year for 2015 in Retail and Multi-Family category. A question was poised on the SDICA forum that I thought would be a good one to address. The question was, “what steps can I take to minimize my risk of buying and owning an apartment buildings right now”? Ask and you shall receive. Here is what I am doing to keep my properties operating effectively. You’ve heard the old saying in business it’s easier to keep a client than to get a new one. Well, your tenants are your clients, and unless you’re grossly under-rented, you need to retain as high a percentage of possible of your current apartment tenants. Keep a reminder in your calendar for 60 days before their lease expiration, so you can talk to them about renewing. If they are going to move, it’s best to find out as soon as possible. It’s helpful to find out why because sometimes you may be able to convince them to stay if its an issue that is rectifiable. Start by spending money on items that are unsafe or may cause emergency calls. These issues will happen, and if possible deal with them before it becomes a problem. Being proactive goes a long way. It also saves a lot of money and aggravation not to get calls at midnight. Paint the unit – Two-tone color choices (wall color and white ceiling) are always a good idea. This will cost more initially, but once it is complete you will rarely ever have to paint the ceiling. You also want to paint the base, case, and doors a nice white color in semi-gloss. The more you can make the place feel like a home rather than an apartment the better rents and retention you will get. I like to make sure the texture looks well-done. It does not have to be perfect, but you definitely do not want patches everywhere. If you’re looking for a good painter, I highly recommend TruLine Painting. I’ve used them on all of my projects and they really do a great job of giving my units a quality facelift. Flooring – I like to use as much tile and or laminate (the stuff that looks like wood) as possible. It costs a little more the first time but lasts 5 times as much as carpet and you will probably get about 5% more in rent. If you have vacancies coming up get on it quick and return calls immediately. Do rent surveys & talk to other apartment owners of similar buildings in the area where you own property (send me an email or drop a comment if you want to know how to do rent survey report & spreadsheet). This is also a great way of finding properties for sale. Make sure to give everyone you talk to your information and let them know that if they ever think about selling to give you a call. We automate as many of the processes as possible by having good checklists of activities we do repetitively. Instruction sets are created on each item to make sure that we do it correctly and consistently. It’s hard to figure out what is and is not working if you don’t do things consistently so you can track them. It makes it so much easier to improve on what we are doing. In addition, it allows me to easily hire people and get them up to speed quickly, or, if I lose someone, I know how to do that task and I am not held hostage or overly dependent on any one person. Here is a quick example of sample turnover procedures. 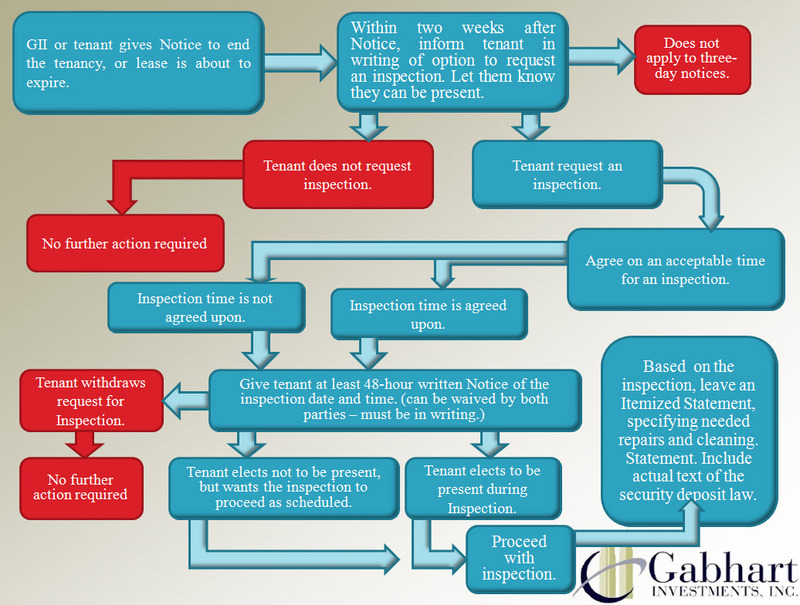 Final walk through (see sample flow chart of walk-through) letters go out to tenant with instructions on ours and their responsibilities. A few things we do to make it more efficient: Use an electronic Realtor (sentry) lock box. This device allows my assistant to generate up to 10 random codes daily from the office. When someone calls my google voice number, I get a text with the voice message which I forward to her which goes in our database. She then calls them back to get the rest of their contact info including an email. 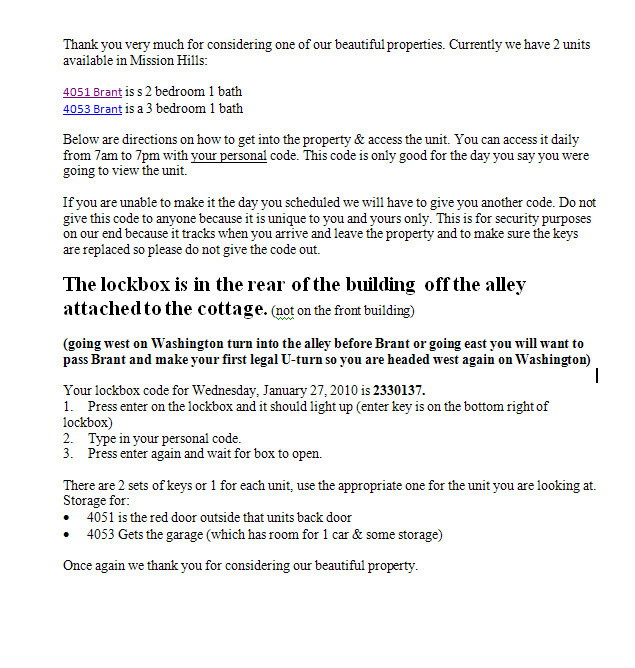 We then send the prospect an email with instructions on how to get to the property, how to enter, and THEIR OWN code which we inform them to not give out to anyone because it is tracked (see sample form letter below which we EMAIL to prospects). We are then able to log on to see who looked at the property so we can follow up to see if they are ready to fill out an application and why or why not. Also now that we have their email address, if they decide not to rent with us we now can update them in the future about upcoming vacancies 6 ,12,18,24 months from now when they may be thinking of moving again. This is crucial for renting out units fast. If they want to fill out an application, we use my smart move/transunion credit/criminal check which they do online and either pay for or they give us the cashiers check and we then pay for (I like this way better because they are more committed after giving us the credit check fee) which we get a copy of along with the prospect. With this service, I do not have to collect social security codes and worry about certain compliance issues. In addition, it also speeds up the process. We then get an approve or disapprove based on our criteria and can then make a decision. Once an application is accepted we send them an approval letter/email/phone call and let them know they will shortly receive a lease package via email for electronic signature using a service called docusign which is legally binding. All of these are put into docusign for email/electronic email distribution. An email get’s sent out which is signed by both parties (legally binding) and no paper has to be printed. The fully executed copy goes in their file which is on our computer server for any reference in the future. Hopefully this can give you some ideas on better ways to operate your apartments which will reduce your risk. As always feel free to give me a call or drop me an email to discuss further. The material contained in articles that appear on gabhartinvestments.com is not intended to provide legal, tax or other professional advice or to substitute for the proper professional advice and/or commercial real estate due diligence. We urge you to consult a licensed real estate broker, attorney, tax professional or other appropriate professionals before taking any action in regard to matters discussed in any article or posting. The posting of an article and of any link back to the author and/or the author’s company does not constitute an endorsement or recommendation of the author’s products or services. 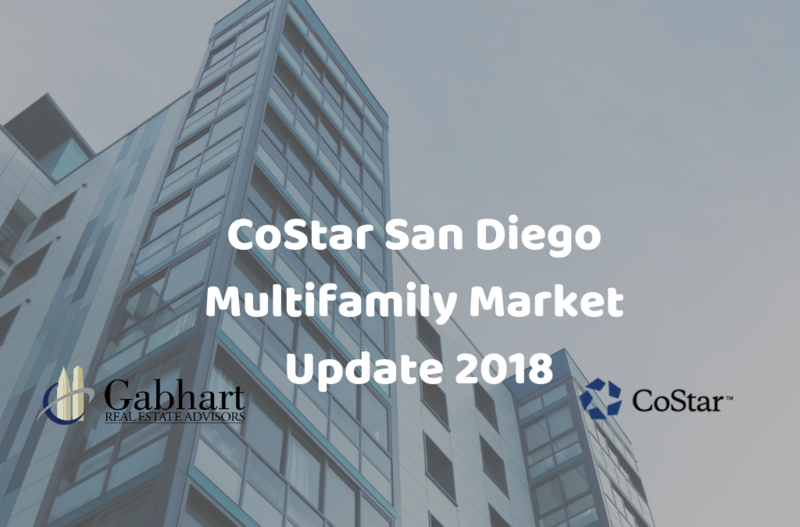 On August 14th, CoStar Senior Market Analyst, Josh Ohl, came into Gabhart Investments to give a presentation on the state of the San Diego Multifamily Real Estate market. 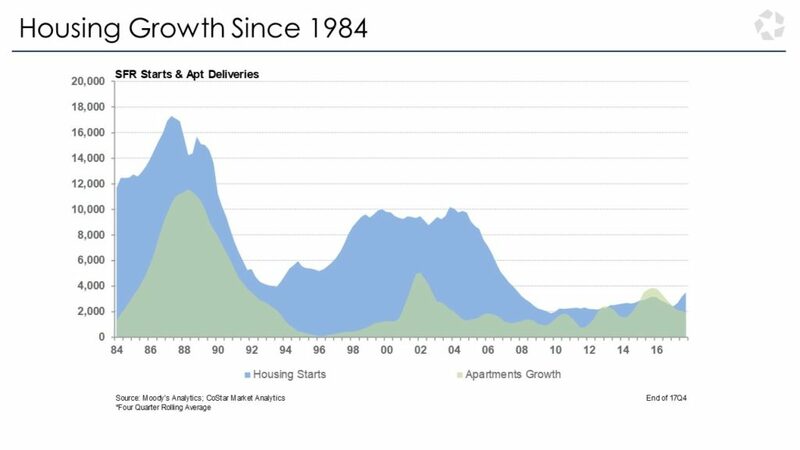 In this fast-paced presentation, Josh offered an in-depth overview of the future outlook of San Diego multifamily real estate, an economic forecast, where we are currently at in the market cycle, and much more. 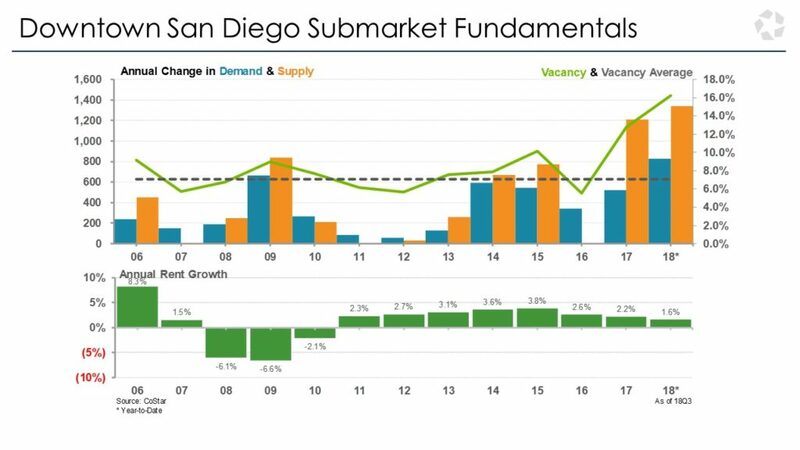 This blog post will give you an overview of all the topics discussed as well as many important graphs and charts designed to give you a comprehensive look at the San Diego Multifamily market. Let’s take a deeper look. The rental market is stable with occupancies hovering right around 94-95%. 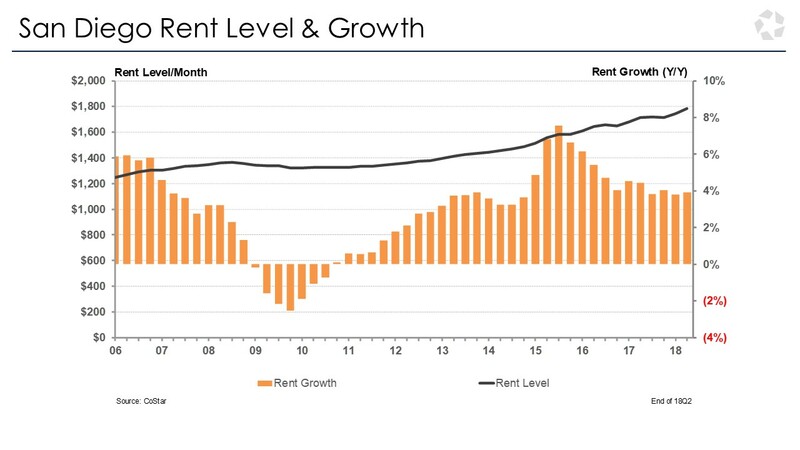 Rent growth year over year is at 4.5%. The lack of housing – we’re simply not building enough to accommodate our city’s growth. San Diego needs 175,000 new units within the decade and is only on pace to build roughly 65,000. The potential tearing up of NAFTA and what trade tariffs could do with Mexico may lead to issues. We currently do about $6 billion of trading with Mexico every year out of San Diego. Over 100,000 jobs in the region are tied to trade. This may impact the metro to some extent. Tariffs could also impact developers costs with imported materials. We just finished the first half of 2018 with the strongest venture capital investment. $450 million of venture capital investment went into life sciences. The lack of a San Diego Convention Center expansion could drive away Comic Con which just renewed their lease through 2021. That’s about $150million of economic impact. Expansion – we’re into year 9 of expansion but it’s only a matter of time before the bubble does in fact burst. Proposition 10 – Californian’s will be deciding whether or not to repeal Costa-Hawkins and enact the Affordable Housing Act (which would give local jurisdictions the right to pass rent control measures). If passed, this could be a disaster for the California and San Diego Economy. Locally, National City Residents will be among the first city in San Diego County to decide on rent control. The National City Rent Control and Community Stabilization Ordinance will be decided on. The impact could be felt by both landlords and tenants as landlords will lose property rights and tenants will face tougher conditions when finding housing. If you’d like an official copy of the ordinance, let us know in the comments below. What’s going to happen with Qualcomm Stadium? Are we going to put a San Diego State University expansion campus there or Soccer City? Or will we just be looking at the same old obsolete eyesore for years to come? Likely it’ll be the last. Voters may not have time to be familiar on these very last-minute ballot efforts and spending tax dollars on a development isn’t always popular. 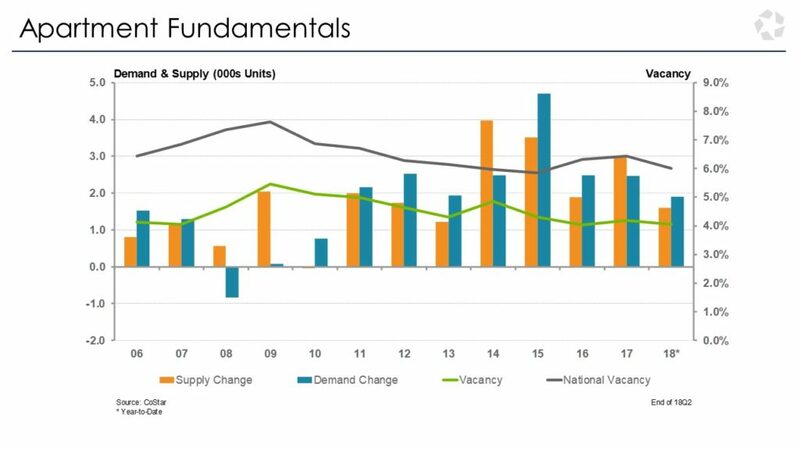 It generally doesn’t matter what is built, there’s typically going to be a demand to fill those units. Vacancies are flatlined at a steady 4%. One trend we’re starting in San Diego is that occupancy is hovering right around 94-95%. Lower vacancies are compelling people to stay in their apartments longer. The average resident stays for about 2 years. Lower vacancies are also good for landlords. Renewal increases are strong at about 4-5% a year and when the tenant moves out, rents generally can be increased by about 10-15%. This is great, however, rent control may jeopardize many of these opportunities (more on this later). These numbers only reflect buildings that are actually being built. You may notice other sources indicate higher levels, however, those sources may factor in buildings that simply get a permit but never actually break ground. 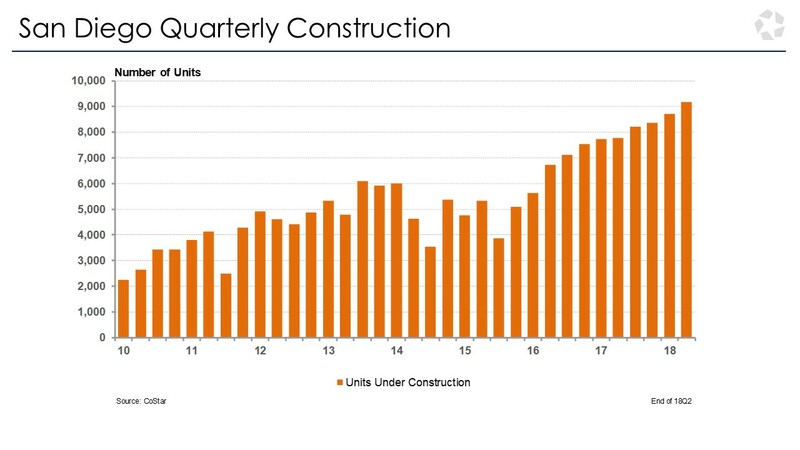 Construction is picking up but it’s nowhere near enough to meet the growing demand. Cost of lumber has gone up 20% since 2017 – this could mean higher construction costs. Proposed tariffs could have an impact on developer’s proformas and smaller developers may feel the increases significantly. About 25% of downtown’s inventory is currently under construction. In Carmel Valley/Del Mar with One Paseo, about 10-12% of the current inventory is under construction. Pockets of Mission Valley are seeing some construction with areas zoned for higher density residential. 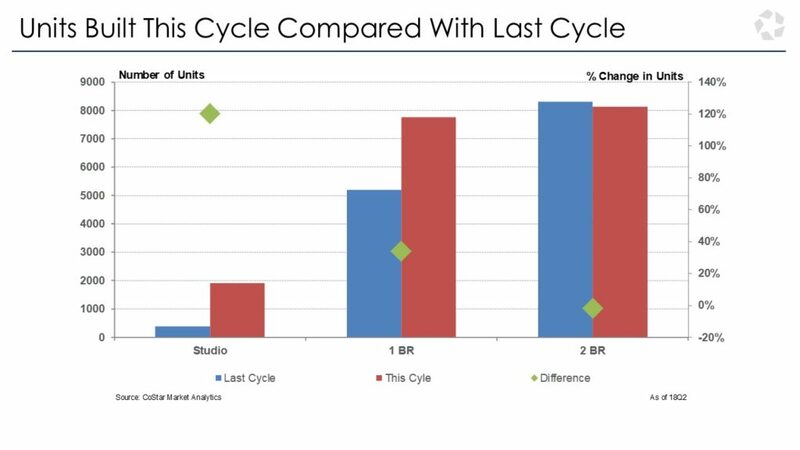 One of the biggest trends that we have observed during the last cycle compared to this cycle is the change in floorplans. 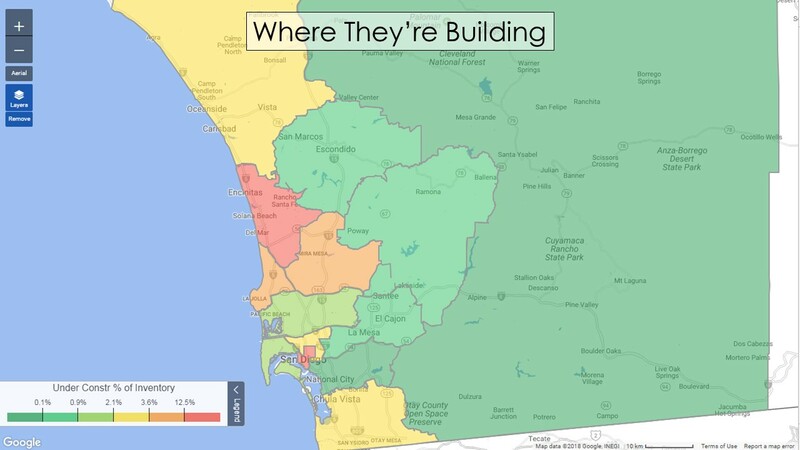 San Diego is one of the largest metros in the US where floor plans have shrunk. This could also mean rent per square foot is increasing and people are waiting longer to get married/start families so there’s less demand for larger spaces. San Diego ended the second quarter of 2018 with year over year rent growth of 4.5%. Among major metros in the US, San Diego is in the top 10. The average rent in San Diego is approximately $1800. CoStar anticipates positive rent growth over next few years. This could be drastically different this time next year if Proposition 10 is passed on the November ballot. This would repeal the Costa-Hawkins Rental Housing Act and allow for cities to pass their own rent control ordinances. Don’t believe it’ll happen? In November, National City will be the first city in San Diego County to decide on rent control. This has the potential to harm landlords and renters. 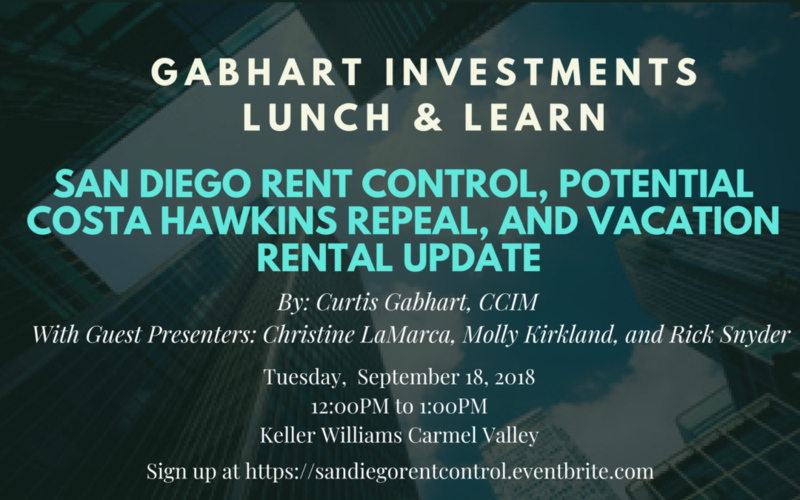 I’ll be hosting an informative lunch and learn on Tuesday, September 18th, where you can learn more about Proposition 10 and the impact rent control may have on San Diego. This will have a strong emphasis on the san diego multifamily market, however, all property types will be discussed. I strongly encourage you to attend this informative event. Free lunch is provided to those who RSVP. 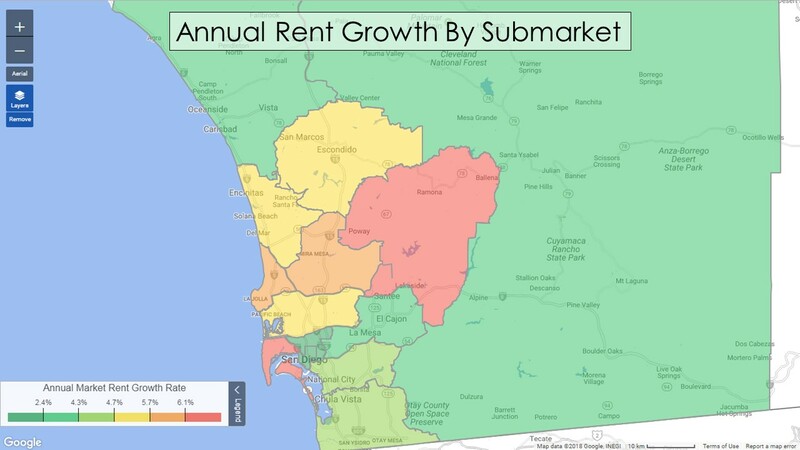 Rent growth is the strongest in Point Loma at 10%. Areas like East County, UTC and Downtown are seeing high rent growth. The coastal markets are reaping the benefits of the increased demand during the summer months. The San Diego rental market is seeing unprecedented rent growth and health. 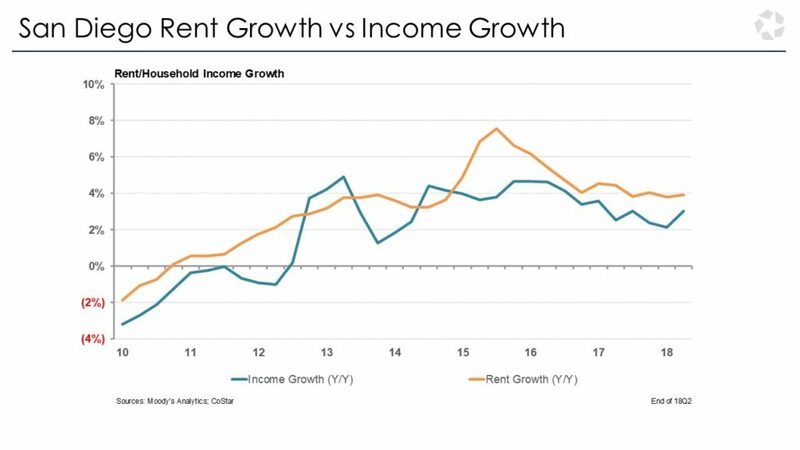 Incomes are not growing as fast as rents are growing, this is leading many San Diegan’s to downsize or share units. This trend has continued for the past 7-8 years and probably will for many years to come. Historically as rents continue to grow, people will look towards home ownership. 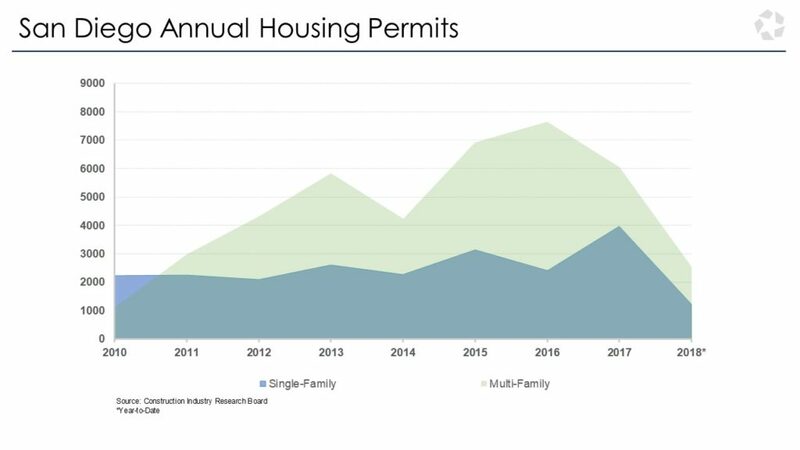 Historically San Diego has been building more single-family residences (SFR) than multifamily units, however, these trends are starting to change. We’re actually building more apartments now. this could be due to a lack of land or simply demand changes. The San Diego Housing Commision estimates in the next decade based on population growth, we need about 175,000 additional units of supply. This equates to roughly 17,000 units each year. San Diego is FAR behind these numbers and is experiencing a housing crisis. Roughly 3,000-3,500 multifamily units are being added each year. Single-family permits are only averaging about 2,000 a year. This places us about 12,000 or so units behind each year. 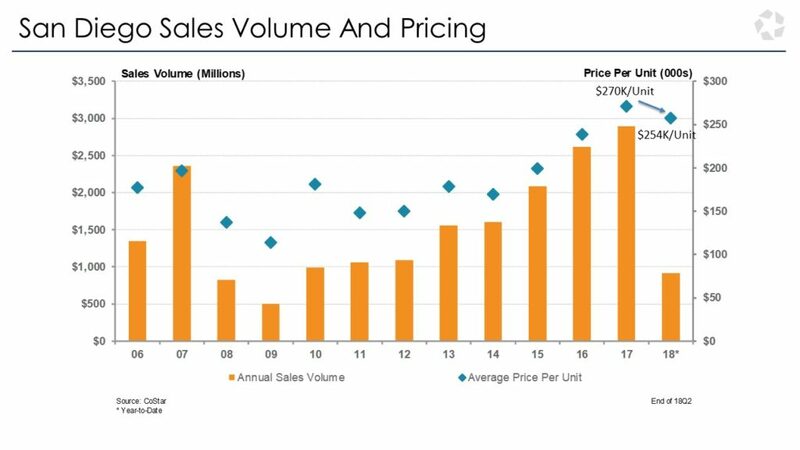 The San Diego multifamily market is having a really strong run as of late. 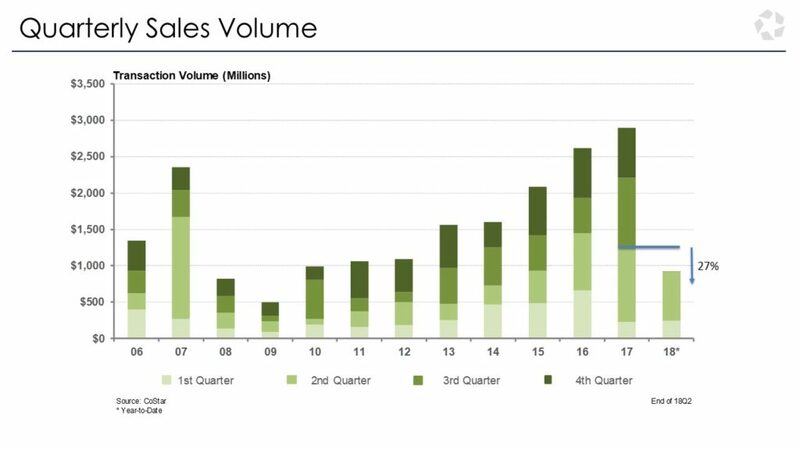 Peak sales volume in 2017 was led by areas like Mission Valley which had $900 million in total sales volume. This is attributed to large deals like Pacific Ridge. Last year we hit peak price at $270k a door and this year in the 1st half of 2018 we’re down to $255k. This isn’t a major cause for concern but should be something to watch for. Newer construction on average is ranging between $400,000-450,000 a door with exceptions like The Dylan in Point Loma where prices were at about $500,000 a door. In the first half of 2018, we’ve only had 2 deals go over $100 million. 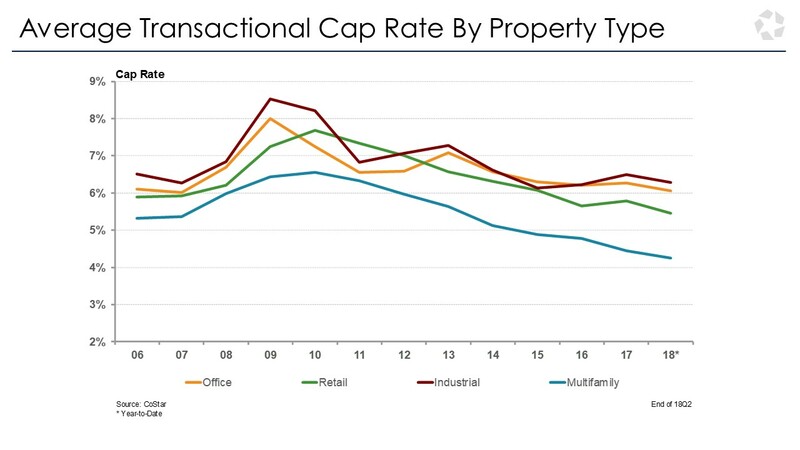 Industrial properties are leading the way with the highest cap rates, followed by office, retail, and multifamily. Along the coast, we’re seeing deals close at insanely low cap rates of 1.5-2.5%. Many of the 5-5.5% cap rates in areas like National City, Chula Vista, La Mesa, North County, etc… are no longer around. 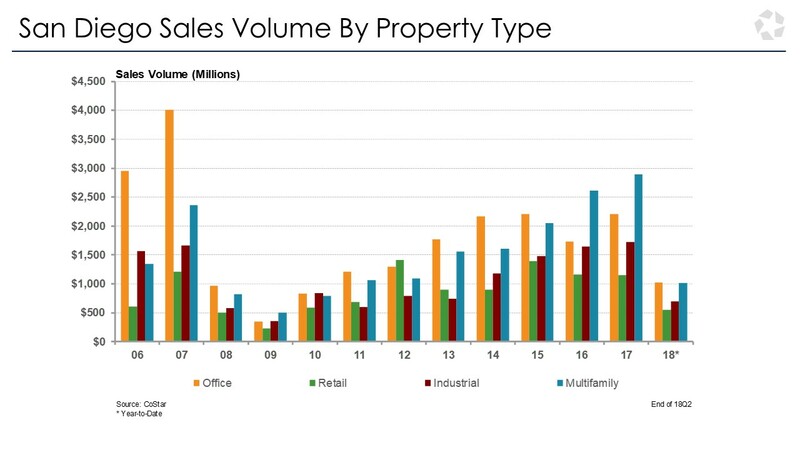 Our two favorite property types are multifamily and industrial. 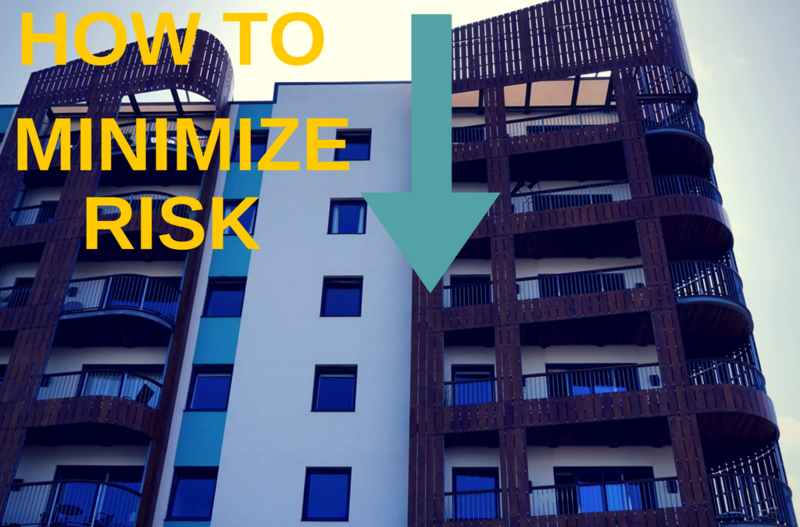 An ideal strategy may be for someone to move out of a lower cap rate multi-family property that could possibly fall under rent control in the future and move to a higher cap rate industrial building. People with graduate degrees are coming to San Diego. Our tech and life sciences industries have driven significant growth. Those with a high school education are moving out due to a lack of wages that can meet the increased cost of living in San Diego. 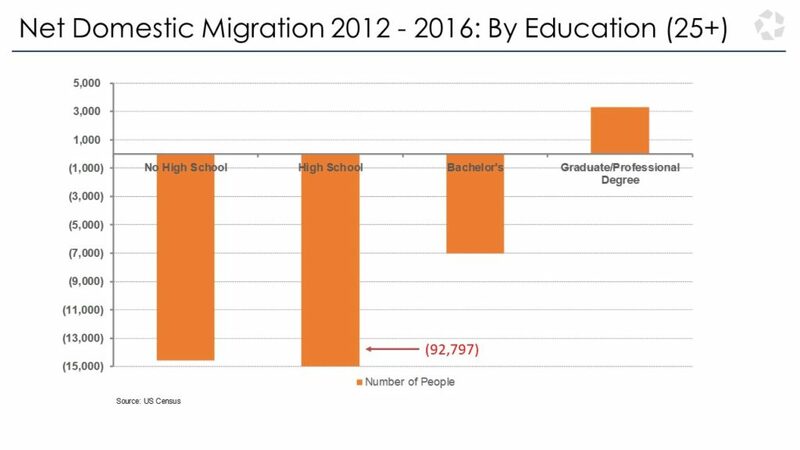 International migration has been the driver of our population growth. This can be attributed to factors like our growing life sciences and tech industries among other things. Many San Diegan’s are beginning to migrate to more affordable markets like Phoenix, Texas, and the Inland Empire. From 2012-2016, 42,000 people migrated to the Inland Empire alone. If this trend continues, San Diego may lose out on a lot of talented workers. Lack of job growth is leading some to pursue jobs in more thriving locations like the Bay Area. Increasingly San Diegan’s are waiting longer to get married. 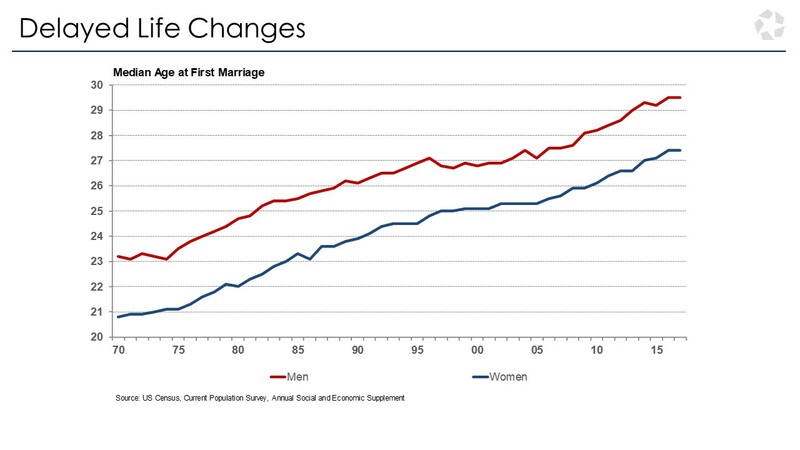 From 2000-2015 the average age to get married went up by approximately 5 years. This means the demand for more smaller units such as studios and one bedroom have increased and the demand for single-family homes has declined. 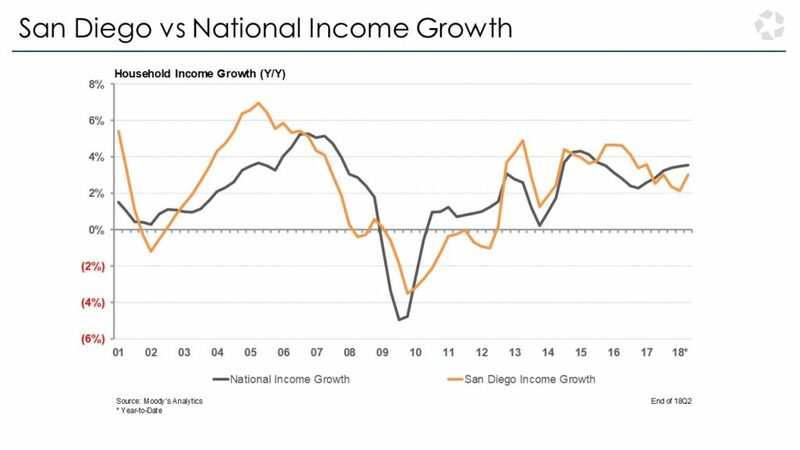 San Diegan’s income growth is lagging far behind the increased cost of living. We’ve only seen about 2-3% increases this cycle. If this trend continues, many working-class San Diegan’s could face financial hardships as they try to afford the increased cost of living. 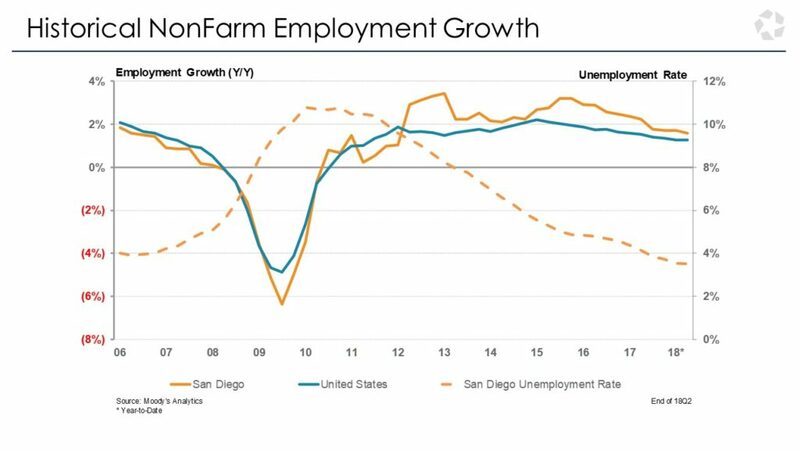 San Diego is currently above the national average for employment. We hire about 20,000 workers year over year in San Diego. In April, Qualcomm laid off 1,300 employees. They gave back approximately 300,000 sq ft of office space. 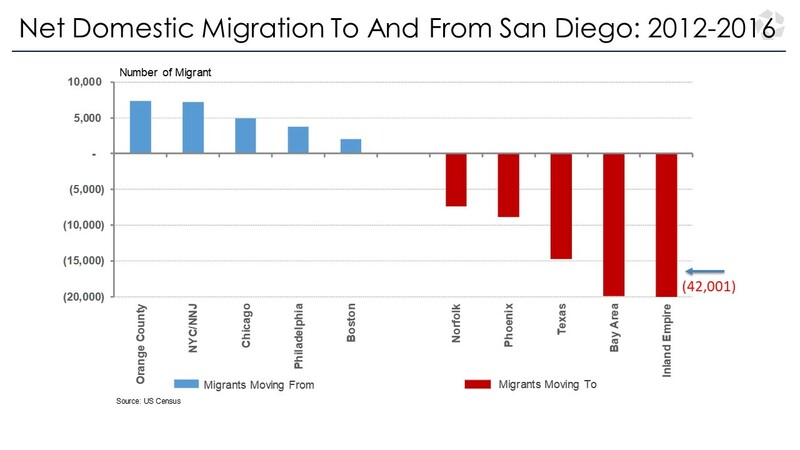 The impact on the San Diego metro area is estimated at $5 billion. This accounts for 4% of the San Diego GDP. For every job Qualcomm creates, another 2.5 jobs are added to the region on average. 25% of downtown’s market is under construction. No new supply in 2016 allowed for the increase in demand on newer constructions. many units are being built there compared to demand. 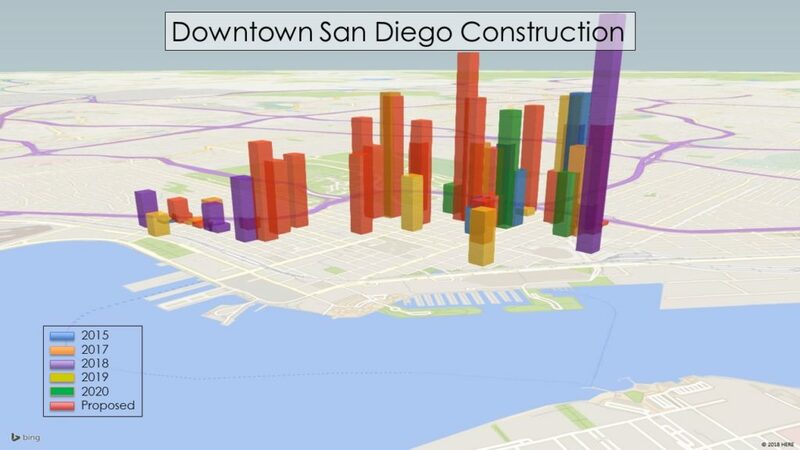 60% of the units coming online this year in San Diego will be in Downtown. It remains to be seen how much demand will be driven to these units in the coming years. As you can see, there is plenty of proposed buildings that may come online in the next decade. It will be interesting to see how this develops. 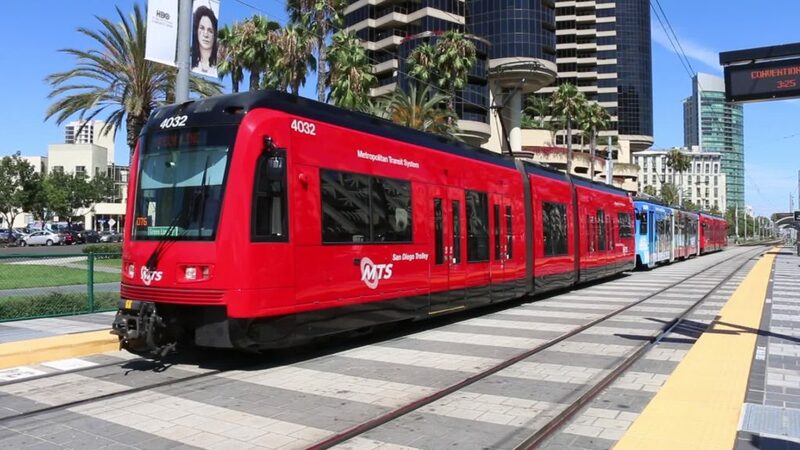 San Diego is banking on the fact that people will start using the trolley with the expansion into the UTC area. There are approximately 112,000 riders a day but that number is only a small dent in the overall commuting population. We are a largely suburban office campus market. People like their cars and there are very few places to get to without a car in San Diego. It will be interesting to see what the trolley expansion will have on areas like Downtown San Diego. The UTC stop has 2 million sq ft of office space within half a mile of it. This is great, however, the question becomes, “who’s going to want to walk half a mile in a suit in 90-degree heat”? Or what about those who simply have driven their whole life and don’t see the point in taking the trolley? The trolley will be vital to continued development growth, but it remains to be seen if San Diegan’s will ever adopt it in large numbers. Californian’s will get to decide in the November ballots the fate of the Proposition 10, the so-called “Affordable Housing Act (AHA), which would allow for cities to adopt rent control. The AHA seeks to revoke the Costa-Hawkins Rental Housing Act, which prohibits rent control on buildings built after February 1995. Some San Diegan’s believe this would provide an answer to our housing crisis, however, many professionals and economists disagree. This initiative is bad for homeowners and renters and will make California’s housing crisis worse. It is estimated that if Proposition 10 is passed, property values will fall 20-25% across the state of California. Prop 10 is flawed and doesn’t create one unit of housing, it discourages new housing. Experts believe rent control would be detrimental to the San Diego economy and would discourage new housing development, further exacerbating the housing crisis. Experts also argue that rent control would eliminate many incentives to own rental properties. This could cause harm to both owners and tenants. Rent control has already been adopted in several cities around the United States, and the results have proved to be harmful to the overall economy by shrinking supply of affordable housing and driving up rental market prices. National City is the first city in San Diego County to try and pass a rent control ordinance (Proposition W). If passed, this could be a watershed moment for other cities in the county to pass such ordinances, further inhibiting our housing supply and placing both renters and owners at greater risk. Continue reading below to learn more about rent control, Costa Hawkins, Prop W and the impact they would have on the San Diego economy. San Diego is facing a profound housing crisis. Rents keep climbing and supply keeps falling desperately behind demand. According to the San Diego Union Tribune, in March of 2018, the average rent in San Diego County hit an astonishing record of $1,887. San Diego now ranks as the ninth most expensive market in the United States. Many San Diegan’s are finding it increasingly hard to afford rent and are turning to the government for answers. Their solution? Adopt the Proposition 10 (Affordable Housing Act) and repeal the Costa-Hawkins Rental Housing Act which would allow cities like San Diego to decide on their own rent control measures. The initiative received more than 650,000 signatures and will be placed on the November 6th ballot, giving Californian’s the option to decide on this issue. Many economists and experts agree that rent control offers no benefits for all parties involved and would be disastrous for our local economy. How would rent control affect San Diego? Let’s take a closer look at the various players in this debate. The Costa-Hawkins Rental Housing Act is a California state law that was adopted to counter vacancy control ordinances and spur new construction of single-family homes. It prohibits cities from putting a rent cap on single-family homes or apartment buildings built after February 1995. It gives landlords the right to raise rent prices to market value when a tenant moves out, otherwise known as a vacancy control. Costa-Hawkins does NOT outlaw rent control. Cities like Los Angeles and San Francisco have been able to adopt some forms of rent control but within the state law. What Is Proposition 10 (Affordable Housing Act)? It aims to restore California’s cities and counties to develop and implement local policies that ensure renters can find and afford decent housing in their areas. Improve the quality of life for millions of California renters and reduce the number of people who face critical housing challenges and homelessness. Supporters of this bill hope that if passed, each California city would begin to pass their own rent control ordinances. In turn, they believe rents will go down, and that many Californian’s will be able to find affordable housing. They believe that increased rents are a result of landlords fueled by monetary greed. This act would allow cities to prevent landlords from increasing rents once a tenant leaves (among other things). Curious what those other things are? We’ll break down what that could look like later in this article with National City. While it is no question that rents are sky-rocketing and that a solution needs to be reached – allowing cities to pass rent control ordinances is not the answer. In fact, I would argue rent control would just exacerbate the problem. A recent study by the Legislative Analysts Office (LAO) looked at Proposition 10 and said it would lower ALL property values so much so that the state stands to lose $10’s of millions of dollars over the next few years as a result of lower property taxes. Repealing Costa-Hawkins would lead to shortages in both the quantity and quality of housing. Profits are what incentivize landlords to maintain a building in good shape. If rents are capped at a certain limit, what is the incentive for landlords to maintain the building? Buildings would become neglected and long-term improvements wouldn’t be invested in. This can create unsafe living conditions for tenants. Rent control would limit property owner’s potential cash flow to dangerous levels. When you think about things like increased expenses and rising interest rates, this could put owners at risk. If the owner can’t make their mortgage payment because rents have been caped, they risk losing their property. This could create a domino effect amongst many property owners. Tenants might also have to look for a new place to live. There are already many risks associated with owning a multi-family building, so if you factor in rent control, what is the incentive to buy a place? Owners might opt to convert their building into condos if they do not see enough cash flow to turn a profit. This would take away even more rentals from the San Diego market. In 2016, the Union Tribune asked 14 experts whether they believed rent control would benefit the San Diego economy, all 14 experts answered, “No”. They cited everything from shrinking the supply, decreasing affordability long-term, to driving tenants out to repurpose buildings. History has shown us that rent control doesn’t work. Look at New York City in the 1970s and 80s. 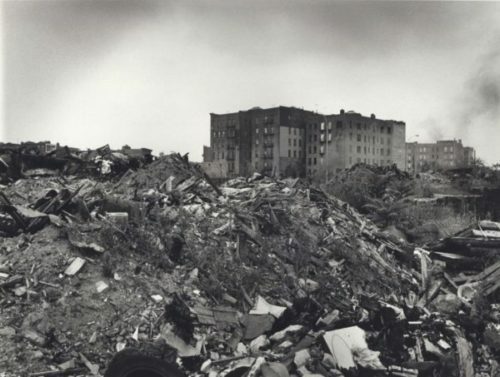 Landlords simply stopped maintaining the buildings, amenities were no longer looked after, living conditions became dangerous, and eventually, entire streets blocks were left vacant. New York’s neighborhoods fell into an economic recession and investment was at an all-time low. This issue is much closer to home than you may think. The National City Rent Control and Community Stability Ordinance (Proposition W) will be voted on November 6th. This ordinance will halt construction, harm the local economy, and do nothing to help with the housing crisis. Caps annual rent increases at an amount equivalent to the increase in the Consumer Price Index (CPI), but never more than 5%. Rolls rent back to Spring 2018 for existing residents that were in their units at that time. This means if you didn’t increase your rents then, you’re locked into those rates. Upon receipt of a petition by a tenant or rental owner, the rent may be adjusted upwards or downwards in accordance with the Measure. Creates a five-member rent board. At least three members must be tenants in controlled units. There are no seats specifically for property owners. You could, in theory, end up with a 5-member tenant board. Creates a per unit fee to support the Rent Board, starting at $120 per unit per year (most existing Rent Boards charge $350 per unit per year). That comes right off your bottom line, while they’re already caping your rents! The City Council and City Manager shall have no authority to oversee, supervise, or approve the Rent Board’s budget. Requires Rent Board approval for all evictions (little to no recourse should they deny it). Property owners who fail to comply with provisions in the Rent Control Measure can be held liable for damages including emotional distress. The Rent Control Board will make legal assistance available for tenants related to evictions, Board petitions, hearings, and appeals. Enacts Just Cause Protections, limiting an owner’s right to require a tenant to vacate a unit. This makes the removal of problematic tenants very difficult, leaving good residents to suffer. Withdrawal of units from the market requires 120 days to 1-year notice and requires relocation assistance of $7,000 and $10,000 if they are elderly, disabled, or have minor children. If Costa-Hawkins isn’t repealed but Prop W passes, ALL rental units in National City must pay $80/per year/per unit for Just Cause and also will be subject to relocation fees. Owners who move into their own units will also be required to pay relocation costs. Duplexes and homes with “granny flat” rentals will be subject to rent control unless the owner lives in one of the units. Prohibits Ratio Utility Billing Systems (RUBs), thereby hurting conversation efforts. If you decide to renovate the property and put a bunch of money into it, that evicted tenant will have first right of refusal at the market rate which they rented it at before. As you can see, this list is quite overwhelming. National City could very well set the tone for future rent control ordinances throughout San Diego County. It is imperative that this bill not pass in order to save future cities from this same disaster. There are approximately 70,000 residents in National City and 70% of the population rent. With 25,000 registered voters, it is important they are informed of the impact this legislation would have on them. A failure to kill Proposition 10 and Proposition W would create a cascading effect. As these fights continue to go on in cities throughout San Diego County, the costs for various associations and professionals to go out and amend these ordinances to find workable solutions would become astronomical. We would be stretching ourselves far too thin. We need to send a clear message by defeating Prop 10 and Prop W and protecting Costa Hawkins. It’s important to remember that if Prop 10 passes, that does not mean rent control is enacted. It simply allows cities the right to pass ordinances similar to what is trying to be done in National City. Repealing Costa Hawkins and or enacting rent control in National City will not fix California’s (and San Diego’s) housing crisis. What about developers and investors? Would the same incentives remain for them to continue to build new construction if they knew property values would be artificially capped? A recent CoStar report discussed the impact that rent control could have on development. “Many developers are concerned about the economic impact there will be on new development if it is subject to rent control… it would change the “whole economics” of how developers view potential development opportunities… It’s hard enough and costly enough for a developer to make a decision to build housing, and now they are put on notice that the housing may be subject to rent regulation… they may very well be unwilling to make those tough decisions of being invested in building a development”. “the problem is the lack of construction of both single-family and multi-family residential units. Controlling rents would reduce the incentive to build more multi-family units”. The Building Industry Association recently commissioned a study that found that up to 40 percent of the cost of a new home is attributable to the 45 agencies that govern home building in California. This means that on a $5,000,000 project, $2,000,000 is spent paying these 45 agencies that govern homebuilding. Legislation like the California Enviornmental Quality Act (CEQA), while once good intentioned, has proven to be a major roadblock to countless developers. Rent control not only discourages development, but it would contribute to less affordable housing developments being built. Austin Neudecker of Rev points out that rent control would increase the prices for those who cannot find a controlled unit. New York City and San Francisco are prime examples where soaring rental prices and rampant abuse of rent-controlled housing exists. Another big concern with rent control is tenants deciding to stay for extended periods of time in their current unit or subleasing it out. This makes it harder for people who need affordable housing to get into units. A 2017 Standford Study and this LAO report also concluded that rent control does more harm than good. I recommend giving these a read, they provide some valuable insight into what happened in San Francisco and their attempts at rent control. Think about this for a moment. If produce is too expensive, should we limit how much the farmer makes? What about if Apple Computers are too expensive? Do we start paying people who make them less? The same concept applies to landlords when being asked to accept rent control. Just because rents are going up, it doesn’t mean the responsibility falls on owners and developers. Rent Control does nothing to empower homeownership. It doesn’t give us more supply and furthermore, it keeps you and your future heirs in a constant state of renting. Is that really what you want? The failure of Government at all levels has created the housing crisis in California, not landlords. Between now and November, we need that message to get to the voters, and that will require support. More permanent solutions lie within increasing zoning, reducing the time it takes to build, and expanding our public transit system and building communities around those transit centers. Lowering parking space requirements could prove to help as we enter a future where vehicle ownership could decline. Developers fees should be prorated by size. As it currently stands, big and small units face the same fees, which gives developers no incentive to build smaller, less expensive units. These are just jumping off points but could be great starts to solving what is arguably one of San Diego’s biggest dilemmas. I will be updating this post as more developments arise, so please stay posted. If you know people who have property, or better yet reside in National City, have them vote no on prop W! 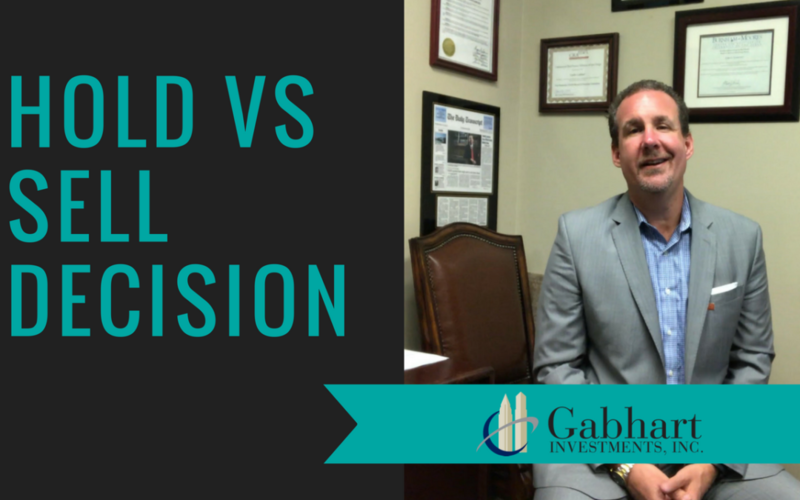 One of the most important decisions for real estate investors is to hold an investment or sell it. This class will demonstrate a methodology to evaluate the hold vs. sell decision. Investment pro-forma’s will be used to measure the impact of keeping an investment or selling it. Estimate investment performance with Net Present Value and IRR. Registration is at $50.Seats are limited to 50! RSVP in advance to reserve your spot! The presentation will be put on by Curtis Gabhart, CCIM and Mark Goldman, CCIM of SDSU. Mark Goldman has been a loan officer in San Diego since 1991. He has a degree in real estate finance from the University of Connecticut. Mark has a Certified Commercial Investment Member [CCIM] designation from the CCIM Institute. He has authored several books on real estate financial analysis and given seminars on real estate financial analysis and financial planning topics. Mark also teaches real estate finance at SDSU. His areas of expertise include analyzing financing alternatives and searching for specialized loan programs. Mark has been a “Certified Community Home Buyers’ Program” instructor. He can help to maximize your home purchasing power or achieve your refinancing goals.